It’s hardly a secret that the military owns some of the choicest real estate in the country, just look at how much of Waikiki is taken up by the Hale Koa resort and Fort Derussey. Some of these prime locations also have campgrounds on them with subsidized prices for military and retired personnel. We took advantage of this in Key West, staying on the Naval Air Station blocks from Mallory Square for $13 a night. 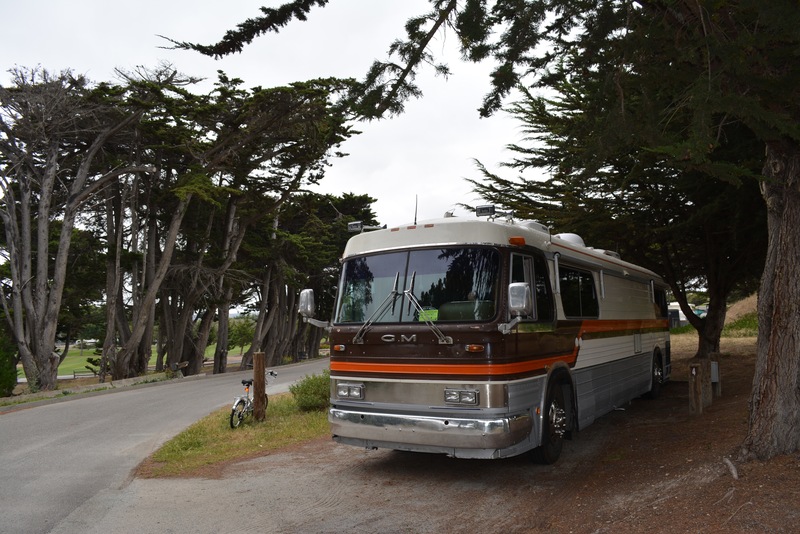 We did it again in Monterey, stopping at Monterey Pines RV Campground, one of the annex properties owned by the Naval Postgraduate School. Prices depend on your exact status and site selection, but we paid $26 per night for partial hook up (30 amp power and water, dump station nearby). Nearby private RV parks cost two to three times as much for what the reviews suggest are far less attractive and poorly maintained spots. Additionaly, Monterey Pines recently upgraded their wifi, which we found surprisingly fast and reliable in the spots near the repeater towers, though a bit iffy further down the way. When you stay as close to the downtown action as Montery Pines allows, you can’t expect a great deal of solitude and nature, but this campground does a pretty good job of providing a beautiful view of a lightly wooded and tree-lined golf course with an abundance of bird and ground squirrel activity, and we even witnessed the final stages of a successful hawk attack on a local bird. Unless you are there for the golf, and it did appear to be a very nice course with prices just as subsidized as the RV park, the real draw to this place is it’s proximity to the Monterey harbor. You talking to me? You talking to me? On our first full day after arrival we took a stroll towards the beach, only 1.6 miles walking distance from the park, ending up on a huge sand dune overlooking the bay. From this point you could walk along the Monterey Coastal Recreation Trail or the beach towards the wharf and downtown areas. We chose the latter, heading another mile or so along the water’s edge towards Old Fisherman’s Wharf, frequently seeing sea lions and harbor seals. Once there we walked the length of the pier, with about a dozen restaurants trying to lure us in with free samples of clam chowder. Since we partook in half a dozen of these, by the time we reached the end of the wharf we were nearly full and only had a small appetizer and a couple of local craft beers. Unfortunately this was the only restaurant or bar we escaped from without a significant bill. We went searching for the wine tasting bar that we had found a couple of years ago with former boss, drinking companion and certified sommelier, Paul. Instead we found one of their direct competitors, Wine From the Heart, transitioning to Sovino Wine Bar, and had flights of half a dozen reds, which were comped after we bought three surprisingly affordable bottles from local vineyards Joyce and McClean X. Our wine stock is back up to preferred levels now that we have picked up stock here and at Heller Estate in Carmel Valley, but I doubt having a full bar will prevent us from threatening the budget with further purchases as we head north through the rest of California and Oregon wine country. We stayed in on our third day, as much to get our budget back on track as anything else, and took advantage of the high speed free wifi to catch up on a few of the television shows we used to watch. 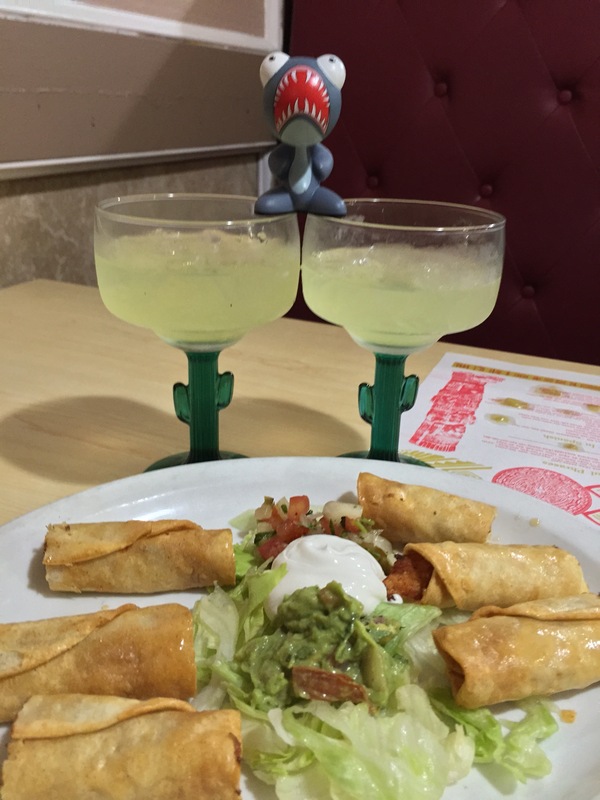 On our last full day, Cinco de Mayo, we headed back into town to find a Mexican restaurant for a few margaritas and food. Among the four to five options within walking distance we selected Lopez Restaurante y Cantina, which had the advantage of having a full liquor license, which meant real tequila rather than the flavored syrup some places use, as well as delicious entres . It did not disappoint, and the service was excellent. We woke at a leisurely hour, did a load of laundry ($1 wash, 75 cents dry, very cheap for an RV park) and broke camp after confirming our starter batteries were holding at 2/3 charge. Four hours of driving with a stop at WalMart for resupply and we arrived back at Coach Maintenance Company in Williams to deal with the battery charging problem and a few other repairs.